With Para X's Intense Emotions label going from strength to strength, it falls on Mart Sine to deliver the 4th release and he has stepped up to the task in style. Warsaw is full on trance magic from the start with a pluck laden intro that signals exactly the musical delights that are about to unfold. The breakdown does not disappoint with big chords and a full on melody that captures the very best of what melodic trance is about. 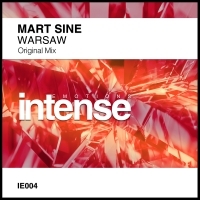 Another huge release on Intense Emotions!! 'Warsaw' is available now from Beatport and iTunes.